A proud “Made in USA” product, Husky Air Compressors are found exclusively on Home Depot and Walmart. Because of this brands policy, you’ll rarely find their products on sites like Amazon. You may find some working refurbished compressor made by them in the Amazon, and they work well. Though their products are available in a few stores, their quality tells everything about them. In the lower-mid range budget line, their compressors are surely efficient enough to buy. 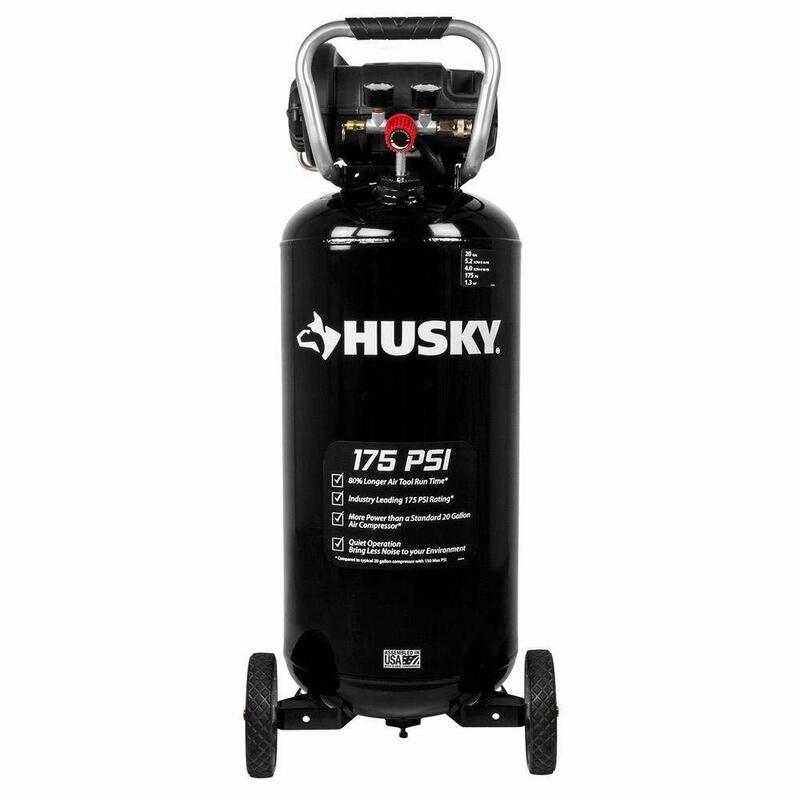 In this article, we will guide you to the pros, cons and the specialties of a couple of Husky Air Compressor review that works outstandingly! 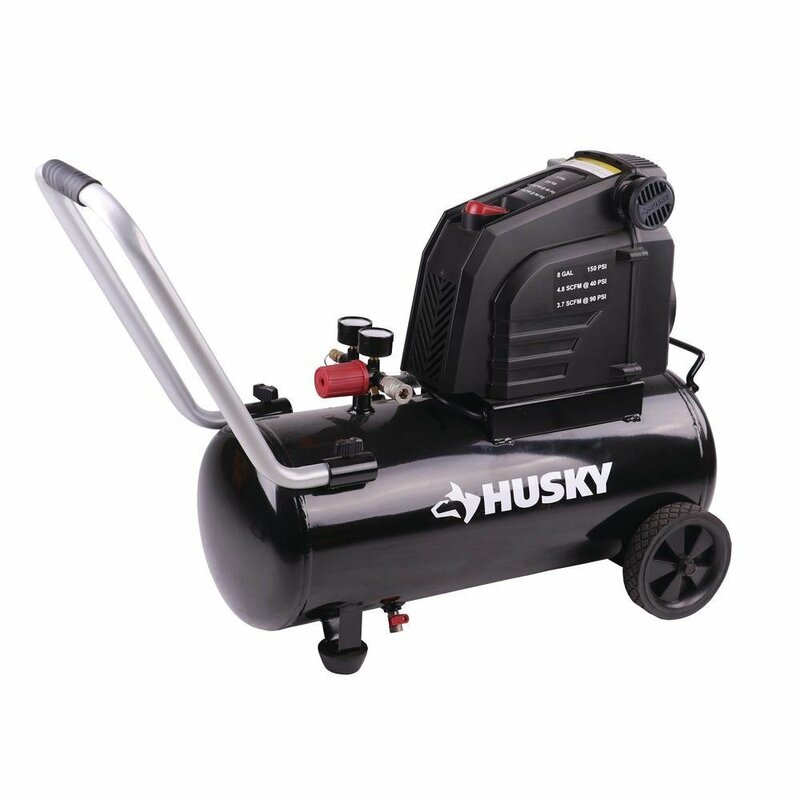 A very high-performance pump and motor drives this Husky 20 Gallon Air Compressor. 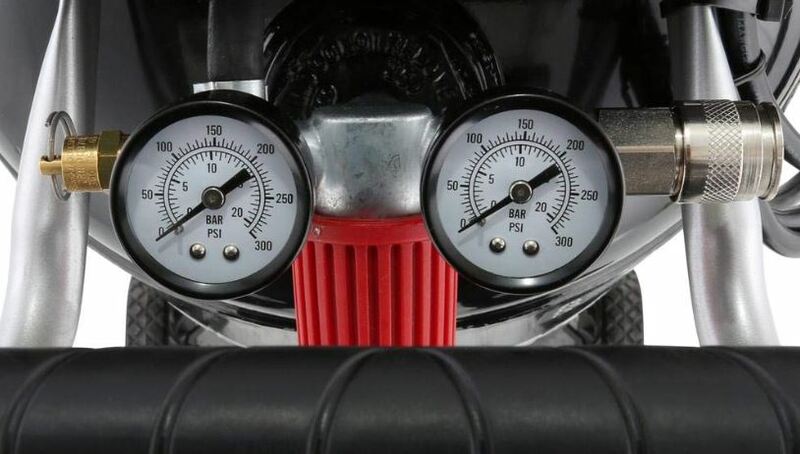 The motor is capable of 175 psi at max. Being a portable compressor, it ticks all the boxes in being secured too. It is fully enclosed, to cover the pump, the motor, and all the other important components. Priced at marginally more than 250 USD this is a very good buy at this price range. Portable Air Compressor, easy to use and handle. 20 Gal. at 175 psi max gives you more runtime. 83 dB noise rating means you’ll have a much quieter compressor experience than normal. High-performance pump and motor ensure greater PSI. What not to like: The only thing that you might not like is the wheel that is made of hard plastic. A rubber one would be much comfortable to hold and use. Apart from that, and some minor issues, this product is very much usable at an affordable price. Cheaper than its 20G 175 psi counterpart, Husky 8G 150 PSI Air Compressor lags behind in most tasks too. But it is dedicated to different jobs too. Capable of doing inflation of bike tires, car tires, sports balls, pool toys, and air mattresses, it is also the most ideal for brad and finish nailers to get your household trim, finish or craft jobs done. 1.8HP pump and the oil-free motor is perfect for its usage, while the rubber wheel is perfect for hold and handle. 20 Gal. at 175 psi- 8 Gal. at 150 psi is excellent at this price range. max gives you more runtime. Oil-free pump requires less maintenance. Rubber handles are easy to hold on for a longer time. What not to like: Don’t get over excited with the label outside of the box that says “Fully encased motor for quiet operation” as this compressor makes a comprehensive amount of noise. You might have to buy an earplug along with it to cope up with the noise. Except that at 150 USD, this is a very good buy. Husky is popular not just because they are affordable and works well, but also because they are not just another Chinese assembled product. Their made in USA products quality are outstanding. You can easily trust on their compressor to work with your existing nailers or any household products that need compressors. They will surely be a great buy!